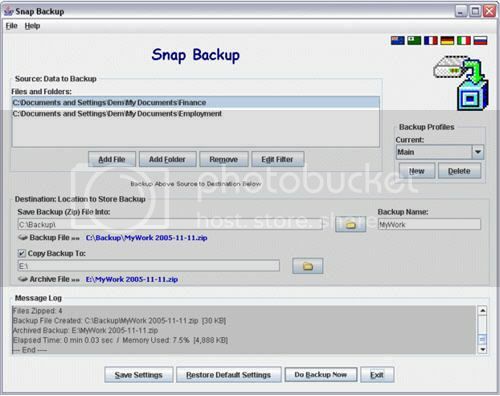 Backup all your important files in windows vista, linux and Mac OSX with snap backup. It is a single click backup utility, that makes it simple to protect your important files. Snap Backup is free and is a convenient tool to backup valuable files in vista, windows, linux and Mac OSX. Most people don’t think about backup, until they loose their data/files.However backing up data/files is very important, no matter how good the operating system or server is.But people realize the importance of backup only when they are actually bitten by the loss.It is true that there are some good data recovery tools for windows.However, preventing data loss is always better than loosing them and recovering it. Snap Backup makes it easy to frequently backup and archive your valuable files/data in windows including vista, linux and Mac OSX. This backup utility has a multilingual Java-based interface, with a list where you can add as many different files and folders as you want to backup. Then you can specify the output folder and let the uility do the rest. Snap Backup has configurable setting and supports multiple languages including English, Dutch, Esperanto, German,Italian, korean, portuguese, russian, spanish and slovene. More importantly, Snap Backup is not just your windows backup utility but it can also run on Mac OS X, linux and Solaris. (as it is java based). Also, this will be a great utility to backup only specified files/folders in windows vista. Most vista editions (Business, Enterprise and Ultimate editions), only allows you to do a complete PC backup or an automatic backup.But note that even in automatic backup, you cannot choose the files/folders to backup.Moreover Vista Home and premium editions lets you do only automatic backup.You cannot schedule the backup in vista Home basic edition. Most importantly, you can backup and restore files in systems running different operating systems. For eg: You can backup files from a system running vista Home premium and restore them on a system running windows XP. Snap Backup supports different profiles for different users, and also lets you filter the contents to be backed up.Being a one click utility, they have not included the ability to run scheduled backups.However it is easier to schedule this via a job scheduler. Snap Backup is a very useful backup and resotre utility for home users and you can check out the userguide . Get Snap Backup and enjoy one click Mac OSX backup, linux backup, windows backup and vista backup.! IS there anyway to cancel a scheduled backup in Vista home edition? I keep receiving error messages that the last backup failed but it will not allow me to change the backup location or cancel scheduled backups to avoid the error message, PLEASE help..
Go to Start > All Programs > Accessories > System Tools > Task Scheduler. In the task scheduler, navigate to Task Scheduler Library > Microsoft > WindowsBackup (Note that you may not find the folder WindowsBackup, if there is no backup scheduled). If you do find it, choose it, then right click on the scheduled task, and choose Disable or Delete (or you can click the scheduled task and choose Disable or Delete in the Actions pane).